US Secretary of State Mike Pompeo says North Korea continues work on its weapons programs despite its leader Kim Jong-un’s promise to denuclearize. Pompeo on Friday flew back to Singapore where Kim and US President Donald Trump met less than two months ago and announced a broad statement on working towards denuclearization. Pompeo visited Pyongyang from July 5-7 for inclusive talks aimed at agreeing a denuclearization roadmap, but North Korea accused his delegation of making “gangster-like” demands. Mike Pompeo’s thuggish approach to foreign relations has offended the North Koreans, E. Michael Jones says. Last month, he told the US Senate that North Korea was continuing to make bomb fuel after American media reports said Pyongyang was building new missiles. A senior US official said on Monday spy satellites had detected renewed activity at the North Korean factory that produced the country’s first intercontinental ballistic missiles capable of reaching the United States. The Washington Post claimed on Monday that North Korea appeared to be building one or two new liquid-fueled intercontinental ballistic missiles at the research facility. 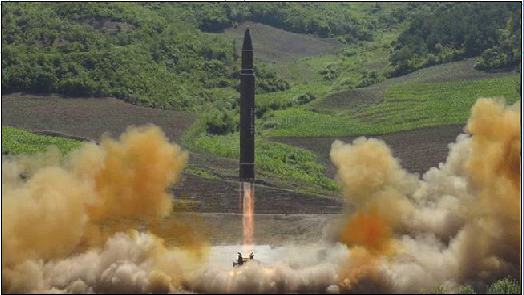 US spy agencies say North Korea is possibly building more intercontinental ballistic missiles (ICBM) capable of reaching the United States.